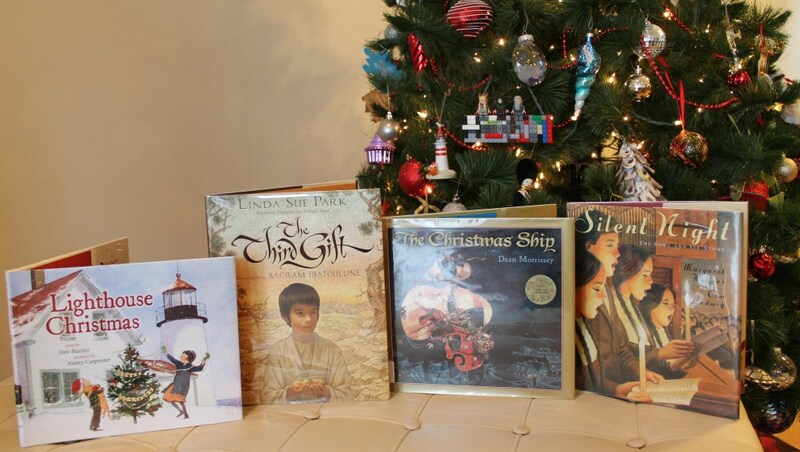 On the eve of Christmas Eve, I thought I’d add four new titles to the list of children’s Christmas books I began in 2011 and added to in 2012 and 2013. Tony Buzzeo’s Lighthouse Christmas is inspired by the Flying Santa Service that delivers presents to lighthouse keepers, Coast Guard members, and their families. Frances and Peter, children of a lighthouse keeper on a remote Maine island, have recently lost their mother, and all three are facing their first Christmas without her. When the children agonize over whether to leave their father to spend Christmas with other family members, a storm leads to a chain of events that changes their perspective on more than just where to spend the holiday. Author and illustrator Dean Morrissey tells the story of Sam, a village toymaker whose store has just been condemned in The Christmas Ship. On Christmas Eve, Father Christmas pays Sam a visit and requests delivery assistance, and when Sam agrees, he discovers his young friend Joey is a stowaway on the magical ship Father Christmas has provided for delivering the Christmas gifts. The illustrations in this book are simply beautiful. Linda Sue Park’s The Third Gift is the story of a boy learning his father’s trade of collecting resin “tears” from the region’s trees to sell at the market. The story interweaves with the biblical Christmas story when the boy and his father sell their tears to three unknown men seeking gifts for a baby. Silent Night: The Song and Its Story, by Margaret Hodges, is just what its title suggests. On Christmas Eve in 1818, a broken organ in the Austrian village of Oberndorf threatened to damper the Christmas Mass, for after all, “Who ever heard of Christmas Mass without music?” Working quickly, the priest composed lyrics and brought them to the organist, who then composed a simple tune the children’s choir could quickly be taught before mass began. Accompanied only by a guitar, the children sang at the service that night, and over the course of the next few years, the song began to spread through Austria and beyond. As always, I’d love to hear from any of you that have recommended books of your own!